Albond Panels can be easily cut using standard woodworking saws (i.e. circular hand saw or panel saw). 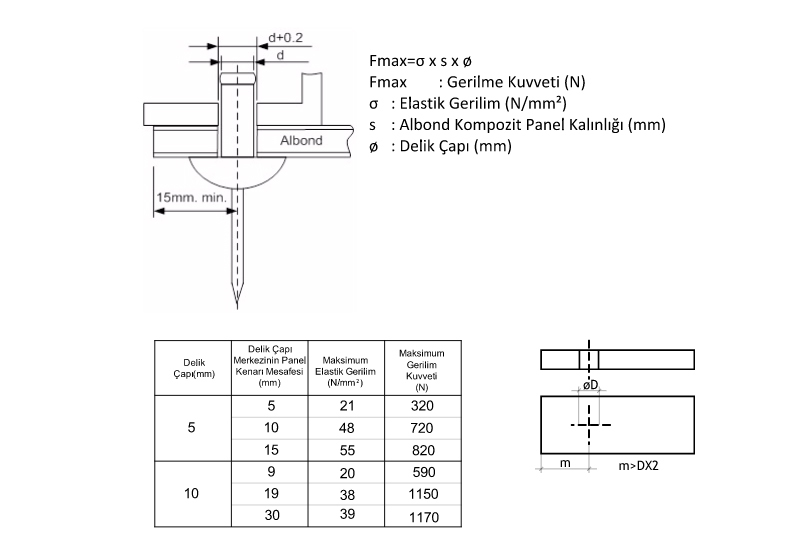 A carbide tip blade made for aluminium and plastic is the most suitable for cutting Albond panels. Panels can be also cut easily by shear cutting. But there should be an angle at the cut point around 1-1,5 degrees. 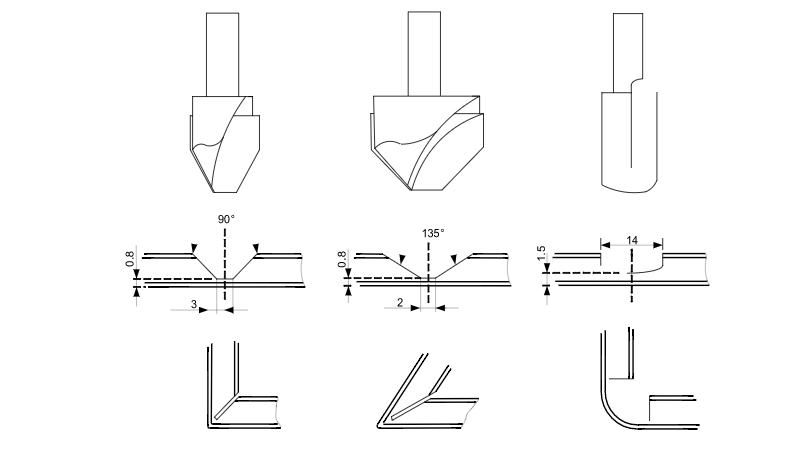 First, the tip should be chosen for routing process according to folding types. Core material should exist on the aluminium at a thickness of approx. 0.3 mm where the point of routing made. If the thickness of the core material will be 0.5 mm or thicker at the routing point then it will not allow to fold the panel properly. On the other hand 0.1 mm or thinner core material thickness at the folding point can cause cracking of aluminium after bending. If there is not any core material on the routing point (if you see bare aluminium), the panel can break at the first impact. Albond Composite Panels can be easily bent and shaped by single roll press machine. 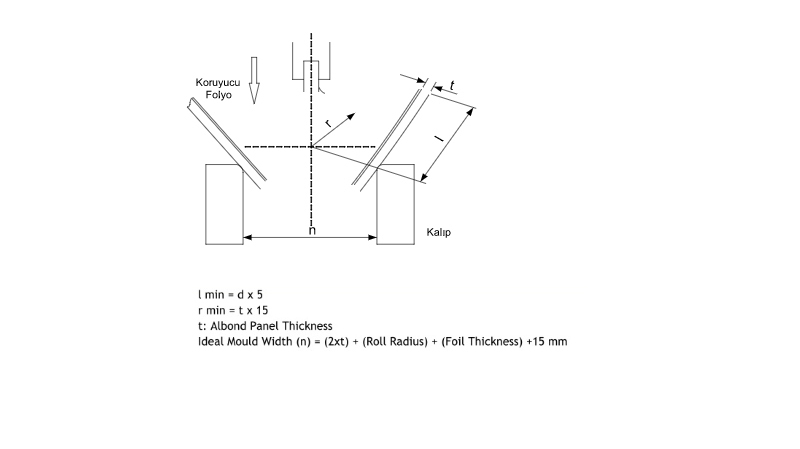 Bending angle is determined by the mould width, roll radius, stroke force and stroke distance. Front opening of the mould must be smooth and in a specific radius. Initially, V shaped canals at 25 mm distance from panel sides are opened. Panel corners are removed and bent towards to the backside of the panel and a 25 mm deep cassette formed. Then panel corners are reinforced by either riveting or bonding aluminium pieces. Albond Composite Panels can be folded on a smooth and straight desk after being grooved. Recommended process temperature is between 20°C and 35°C. Folding process should not be made under environment temperature of 10°C. There may be cracks on the coating of the panels at the bent point if bending is made under environment temperature of 10°C. Albond Composite Panels are connected to aluminium profile and others mostly with nut-bolt, rivet and screw. There can be stresses on the panel because of the forces at the fastenings. These stresses must be within elasticity limits. The fastening materials must have resistance to corrosion (aluminium, stainless steel, strong plastic etc.). Materials like copper, bronze, brass etc., are not suitable to use due to their corrosive effect. The rivet as a fastening material should be chosen appropriate for panel pressure otherwise it will snap under strong wind load. Tensile force, shear force and thermal expansion should be taken into account. Hole diameter must be 0.2 mm bigger than rivet diameter at the connection considering thermal expansion. 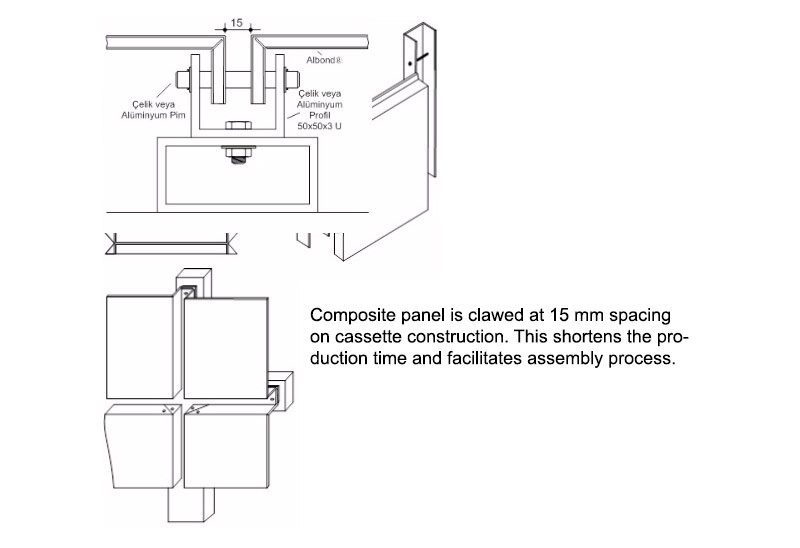 Albond Composite Panels are shaped as cassette and assembled as in the figure below. The profile of cassette system must be made of aluminium or steel. Isolation and silicone application can be done at connections where sealing is important. Silicone must be implemented along the panel with a little slope. The silicone or filling material should have high aging and high adhesion properties even in harsh environments and should not leak onto the panels after some time period. Silicone material has better properties than polysulfide and . * The hole diameter should be minimum 4 mm. * Perforation can be on the same axis. If the perforation has zig-zag on the panel, it will be better. * Perforation area should be between 20-40% of total area.